Christopher is a PhD Researcher and Associate Lecturer for the Anomalistic Psychology Research Unit at Goldsmiths, University of London, studying conspiracy belief and persecutory delusions. 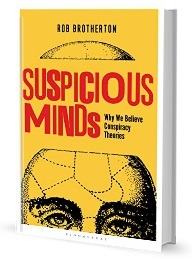 The aim of his research is to explore possible psychopathological links to conspiracy belief, and also to place conspiracy theories into a wider political and social context. He is ThresherX on Twitter. A short post today to bring you a great info-graphic detailing the poll results from the recent Public Policy Polling data. Click to enlarge for the best view!